Sometimes an object is in such a poor state that regular use is not to be recommended. 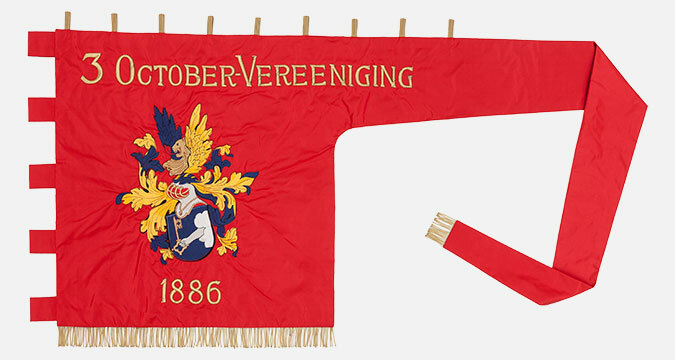 The 3 October-Vereeniging in Leiden has such a banner. Previous restoration to the original banner had been damaged through use. The manufacture of a replica banner for use during the various festivities can relieve the original banner and contribute towards its preservation. ICAT produced a banner from comparable material and, based on photographs, the embroidery work was applied by machine. Various tests were performed to replicate the original embroidery work as closely as possible. The final result can be seen above. The original banner has been preserved and is now exhibited in a display case to stay further deterioration. Click here to see photographs of the entire process.